James Harden and the Houston Rockets have advanced to the next round of the Western Conference playoffs. HOUSTON (KTRK) -- The Houston Rockets beat the Dallas Mavericks 103-94 on Tuesday night for their first playoff series victory since 2009. "It feels good. We've got bigger goals, but it feels good for our guys. 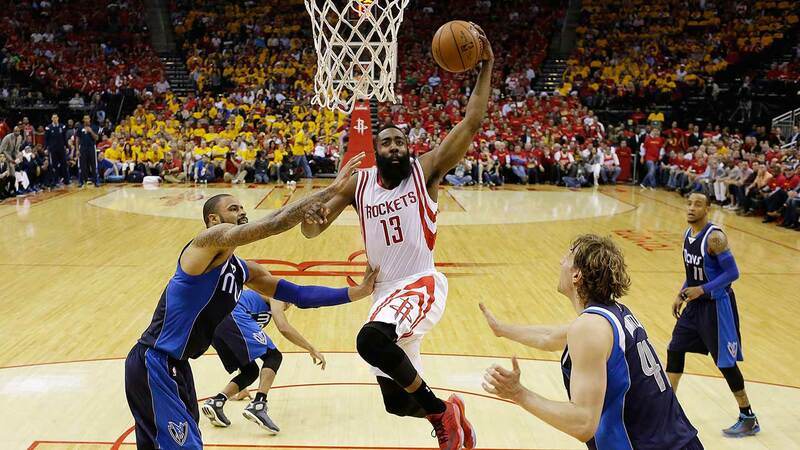 This is just the beginning," James Harden said. Harden poured in 28 points to go with 8 assists and Terrence Jones stepped up with his own 6-0 run in the closing minutes as the Rockets eliminated Dallas. It was just a 3-point game when Jones hit a layup on an old-fashioned three-point play with just over 5 minutes to go. Seconds later, Jones hit a corner 3 for a 9 point lead. But it wasn't over until Harden hit a step back three and Jones added another layup to put Houston on top by 8 with just over a minute left. Harden said this about Jones, "He basically won the game for us." Dwight Howard added 18 points and 19 rebounds in a dominant effort inside. Jason Terry added this, "We haven't played our best basketball." Now the Rockets wait for the winner of the Clippers-Spurs series. Mavs Coach Rick Carlisle added this about the Rockets, "They're legit. They've got a chance at the whole thing."